Two classic contests from Europe in 1970 and 1971. Features many of the greats of the era, including Serge Nubret, Al Beckles and Franco Columbu. HISTORIC CONTESTS – THE FIRST 2 CONTESTS FILMED BY GMV IN EUROPE. 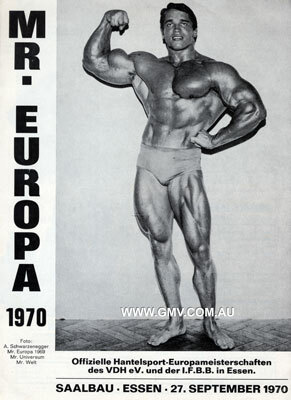 The 1970 IFBB Mr. Europe segment runs approximately 20 minutes. The 1971 IFBB Mr. Universe segment runs approximately 45 minutes. Music soundtrack has been added. 1970 contest photos by Benno Dahmen and others courtesy the IFBB. The 1970 contest was held at the Saalbau in Essen, Germany on Sunday September 27th. The promoter was Peter Fasching who died tragically in 1983. See more below on my connection with this promoter. This classic contest was held in Essen, Germany in the magnificent and historic Saalbau Concert Hall, scene of the triumph of Arnold over Sergio at the 1972 Mr. Olympia, and present host city of FIBO. It was the highest standard Mr. Europe contest I have ever witnessed, boasting a couple of competitors in Franco Columbu and Serge Nubret making it worthy of an Olympia stage. In the Short Class, Franco out-muscled his main rival, Europe’s Mr. Abdominals, Pierre Vandensteen from Belgium. The fantastic, rock hard and symmetrical physique of Giuseppe Deiana of Holland could only make 3rd place. He was a Mr. Universe class winner in 1971. Of note was Adolf Ziegner who was known for his massive arms at such a short height. Sort of an Austrian Lee Priest of his day! Next the Medium Class. It was a well deserved victory for local hero, the shredded Gunter Heinlein over the more massive physique of Janko Rudman of Sweden. In the Tall Class there was no doubt that Serge Nubret had the class victory as soon as he walked out on stage, he was so outstanding. Ripped as ever and with his classic lines, great abs and wonderful posing routine and stage presence. His nearest rival was the tall Austrian Karl Kainrath over his more massive countryman Harald Gobetz. The 3 class winners are finally shown fighting it out in the posedown for the overall Mr. Europe title. See top photo on the DVD cover above. The 1970 title finally went to FRANCO COLUMBU by a very narrow margin over a magnificent Serge Nubret. See FULLRESULTS below. Special Note on Peter Fasching & Benno Dahmen. I have been advised by Thomas Klose that Benno Dahmen commenced his business cooperation with Peter Fasching on Oct 1st, 1963. Then on December 5th, 1965 they founded the company “Athletik Sportversand” and soon followed their Athletik Sportjournal magazine in 1968. They promoted many wonderful contests including the 1972 Mr. Olympia in Essen, won by Arnold in that historic contest where he narrowly defeated Sergio. Peter Fasching gave me my first break in Europe in allowing me to film his 1970 contest, and giving me a seat in the front row. In the ’70s I provided many cover photos for his magazine and was always credited on the Editorial pages of the magazine. Peter died on February 27th, 1983 at the age of 40 years. For some reason forgotten now, the film of the 2 Superstar Guest Posers from USA at this 1970 contest, FRANK ZANE and DAVE DRAPER, could not be found at the time of the contest edit. Accordingly they were not included in this contest DVD. They were both in top shape having competed in the NABBA Universe the week before, and both kindly acted as Judges in the Mr. Europe contest. Frank won Overall Amateur Mr. Universe. The fabulous Albert Beckles (England) Medium Class and Overall winner of the IFBB “Mr Universe” 1971. On the left of the photo is Giuseppe Deiana (Netherlands), winner of the Short Class and third in the Overall. On the right of the photo is Karl Bloemer (Germany), winner of the Tall Class and second in the Overall. Serge Nubret staged this event at the huge Palais De La Mutualite theatre in Paris, France. There were 53 competitors from 37 countries making this one of the most broadly represented event in years. The battled it out in front of a madly cheering sell-out crowd of 3000, many of whom had come to see Arnold, Sergio and Franco who were appearing later on the programme (and not part of this DVD). In the short class it was a classic battle between Renato Bertagna of Italy – a smaller (white) version of Sergio Oliva’s physique, and the super symmetrical and hewn out of granite physique of Italian-born Dutchman Giuseppe Deiana. In the medium class it was an amazing 3-way battle between Ed Corney of USA – at his very peak, Al Beckles of England – a legend with much more than the most amazing the biceps in the world, and the ripped and rock-hard slab of muscular beef from Turkey – Ahmet Enunlu. Another very popular with the fans was Serge Jacobs of Belgium. Finally in the tall class it was another battle between the handsome, ripped and elegant physique of Karl Bloemer of Germany, charismatic fellow German Helmut Riedmeier. It seemed to me that Helmut found more favour with the judges than Mike Katz of USA whose placing greatly upset the fans. Vic Downs from Canada was another who was extremely popular with the fans. It was controversy time when the results were announced for the Medium Class. Pandemonium broke loose with booing, jeering and absolute crowd rage. It was the most forceful display of audience crowd anger I have subsequently seen in my 44 years of attending physique contests. This was triggered by Al Beckles being called in 2nd place with Enunlu announced as the winner. The rage continued unabated and it appeared that things may even turn ugly. The judges wisely announced that Al Beckles would be added to the 3 class winners – Enunlu, Bloemer and Deiana for the overall judging and posedown. 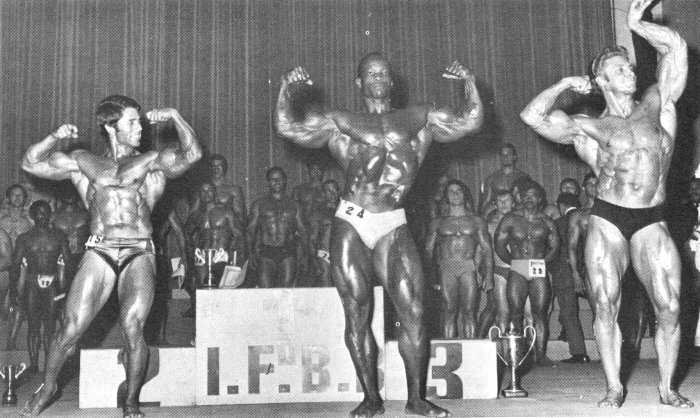 Not surprisingly Beckles won the overall title of IFBB Mr. Universe for 1971 in a very fair and correct verdict with Enunlu graciously handing over his class winner’s trophy to Beckles in a very nice touch of sportsmanship. Runner up overall was Bloemer, with Deiana 3rd and Enunlu 4th. Later on in the programme there was more controversy over the Mr. Olympia lineup, but that is another story. And so it was Overall Winner– AL BECKLES of England.